For Pick Up at Store, THE Dream Carousel Cabinet is now compatible with THE Dream Machine 2, XV8550D. The cabinet was originally launched to go with the DQLT15S, but we’ve expanded the line so you can add this to your Dream repertoire. 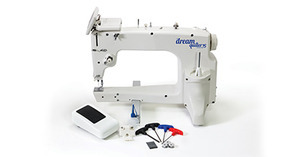 There’s a custom insert that fits with THE Dream Machine 2 so the quilting surface stays smooth and seamless. 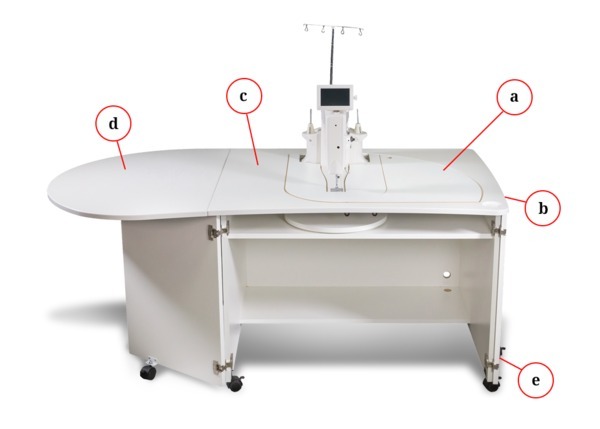 Enjoy the option to do free motion quilting from a side or forward facing position with THE Dream Carousel Sit Down Cabinet. 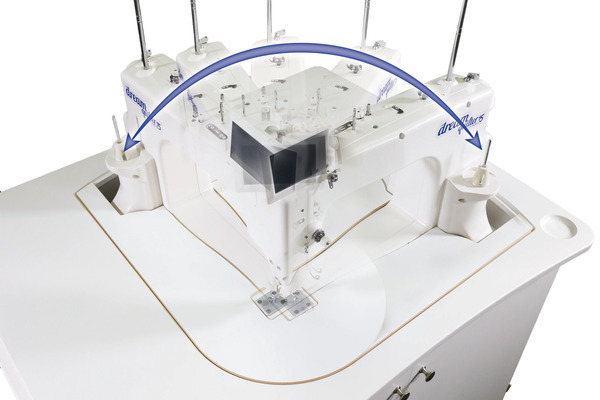 The carousel cabinet easily pivots your machine, a unique Brother exclusive feature, and allows you to quilt in your most comfortable position. 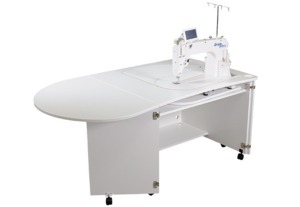 The contoured laminate and spacious folding leaf are great features to utilize the full throat space of THE Dream Quilter 15S and will fit perfectly with THE Dream Carousel Cabinet. THE Dream Quilter 15S is a perfect machine to dedicate to free-motion quilting. 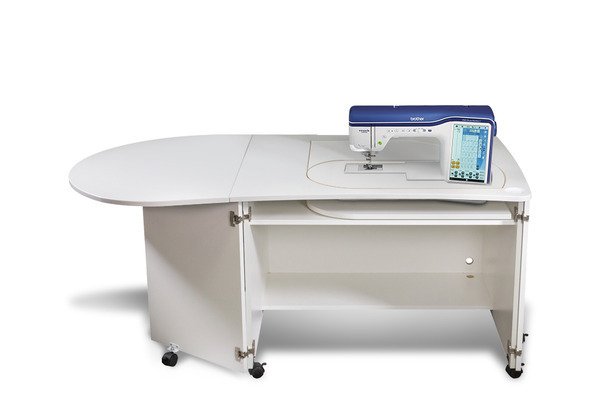 If you enjoy free-motion quilting but wish for a larger throat than your sewing machine offers, you'll love THE Dream Quilter 15S, especially paired with THE Dream Carousel Cabinet. 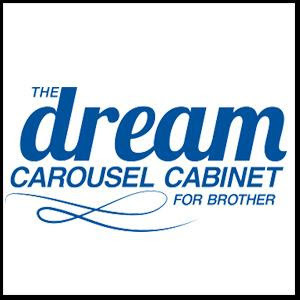 The Dream Carousel Sit Down Cabinet: The Dream Quilter 15S. Shown with Brother XV8500 or XV8550 The Dream Machine 2 Optional insert. Machine sold separately. a. Carousel Feature Easily transition to a side or front-facing free motion cabinet - a Brother-exclusive feature – new to the industry. b. Sleek Design Modern curved design with rounded edges and no corners for a “no-snag, no-drag” operation. c. Smooth Surfaces State-of-the-art contour smooth laminate for easier quilting. d. Foldaway Leaf The foldaway leaf allows you more room to quilt by extending your work area, or fold it away when not in use. e. U-Casters Wheels make moving the cabinet easier across hard or carpeted surfaces. 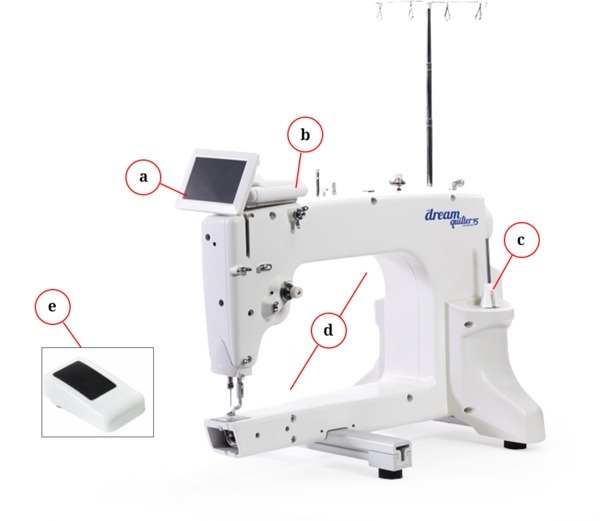 Optional Brother DQLT Longarm Quilting Machine with Foot Control and 90 degree control display screen.